Fifteen Dubai residents are going to Jordan next month to take a gruelling 600km cycle challenge in a bid to raise funds for charity. As part of the 10th edition of Road to Awareness campaign, the Marriot International senior associates will cycle across Jordan in three days from October 12-14 in hopes to showcase the power of sport while raising awareness about the importance of charitable contributions. Starting from the Dead Sea, 383 metres below sea level and the lowest point on Earth, the group will head in a fairly straight line to the seaside town of Aqaba. The second day will see the group ride from Aqaba to the historical city of Petra, while the third day will lead them back down to the Dead Sea. The Dubai team will be joined by other employees across the MEA region, making up a total of 24 cyclists gathered to raise funds for different charities across countries. The funds raised to Dubai will go to Al Jalila Foundation. Having a target to raise a minimum of $500,000 (Dh1.84 million), the group is expected to cover a variety of terrains through their challenge, which demands a high level of fitness and commitment. The challenge, participants said, encouraged them to change their lifestyle and, in return, they will raise awareness about leading a healthy lifestyle. The group now gathers on weekends at different places across Dubai to train for the challenge. Talal Khalife, a Lebanese resident, said he had never cycled earlier. Upon signing up for the challenge, he has been dedicating about three hours a day, six days a week to exercise for the past three months. "I changed my lifestyle and lost a lot of weight in the process. Sports, in general, are all about developing the right mindset," said Khalife, director of global sales at Marriot International. This week, he has finished 300km of cycling. "Cycling is now a hobby that I enjoy practising weekly. It has allowed me to not only stay active and fit, but also to meet like-minded people and friends for life." He added that such challenges help in speaking to people's passions and hearts. "Everyone is now passionate about sports and healthy living. Sports lead to a positive living, discipline and helps in time management," said Khalife. 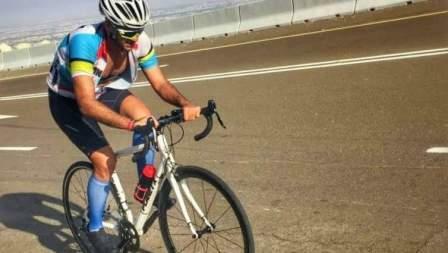 Ramine Behnam, French-Lebanese resident, said he used to be a heavy smoker with a fast food-focused diet but became a dedicated triathlete four years ago, losing about 25kgs in the process. He has now completed one half and one full Ironman races and is preparing for his third, saying the cycle challenge fits perfectly into his regime, with him dedicating 10-12 hours a week towards training. "If you can manage to encourage a few to leave their couches and cycle through these challenges, then you have succeeded," said Behnam, director of development at Marriott International. "If every organisation did this, the world will be a better place." He said such fundraising events help participants encourage their communities and networks to donate, which makes a big difference in society on the long run. Aside from the charitable and physical benefits to be gained, the associates taking part are looking forward to the social, mental, and emotional rewards they can reap from the experience. For Belgian Stephan Auweele, it will be the third time to join the challenge. He said aside from doing what he loves, the aim is "to feel you're contributing to a cause you feel strongly about". "Through the challenge, we are raising awareness of children's struggles and the need of providing them with the life they deserve. As members of the community, we all deserve to have a good living," said Auweele. He noted that sports challenges highlight the importance of making the right choices. "Taking up a healthy lifestyle is all about making the choice of how to use your time. While we tend to complain about the lack of time, it is vital how we manage time," said Auweele. The challenge will be documented through video and photography by a dedicated film crew.